Today’s car and trucks electrical systems have become more complex with the addition for sensors, solenoids, and on board computers. It is very critical for the battery to operate at peak performance. 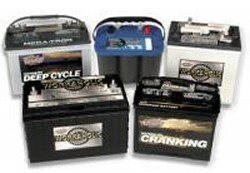 Sergeant Clutch installs premium top quality car and truck batteries with up to a 5 Year Warranty. You can rest assured your vehicle is being fixed right by a certified trained professional mechanic. Whether your problem is the battery, alternator or starter Sergeant Clutch has you covered. Battery Indicator Light On? - The Battery Light indicator is triggered when there is an issue with the vehicle’s electrical system. The cause of the Battery Light can range from something small, such as a loose wire, or loose battery terminal. It can also mean your vehicle’s battery is not properly holding a charge. If the Battery Light comes on while driving you might want to your car running. If you turn your car off it may not restart leaving you stranded. Drive over to Sergeant Clutch for a Battery Light Diagnostic Scan to help determine the problem call 210-239-1600.